Custos is designed to make network assessment and monitoring easy! Built around three very mature projects Custos serves to integrate their operations and consolidate their outputs. Custos provides network and machine discovery features to keep track of what changes on the networks that are managed. The discovey services above, when tied with the a properly configured network (that is, via DHCP and DNS) and greatly assist with organization of addresses and subnets. Custos supports both IPv4 and IPv6 systems. The user-interface is clean and simple, the system is usable right out of the box. And unlike some other consolidation tools, the configuraions of each of the included packages can safely be manipulated out-side of Custos! 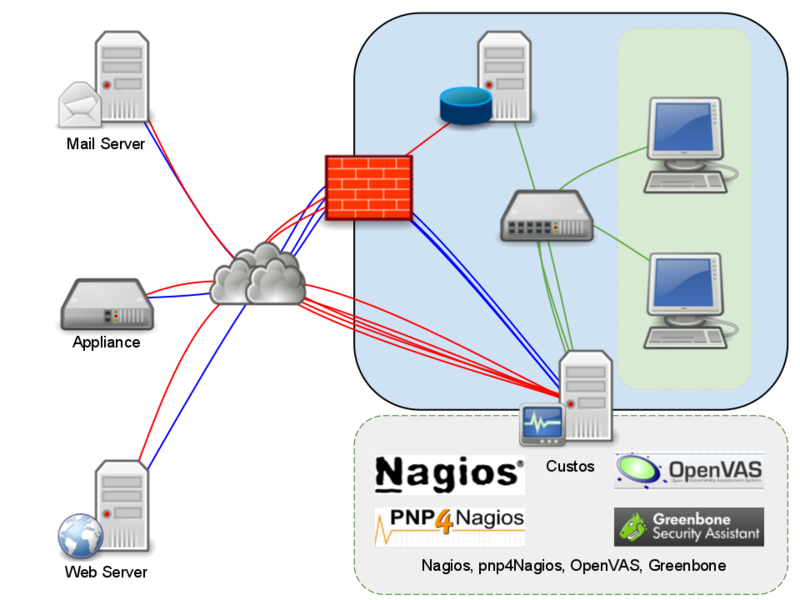 Fully Accessable Nagios, pnp4Nagios and Greenbone Security Assistant interfaces! Notification vai Email, XMPP (Jabber), SMS (Pager) and/or IRC. This diagram shows some theoritical operation of Custos. Custos scans internal networks, discovering & auditing new hosts (green lines). Monitors and audits external hosts from internal network view-point (blue lines). And, if properly configured, monitors and audits external and internal hosts from external view-point (red lines). Custos comes with a simple HTTP REST API which provides JSON encoded outputs. This API allows for external custom applications to be integrated and communicate directly with Custos, Nagios and OpenVAS.